Do you agree with our ultimate Under-21 Premier League XI…? In goal, Stoke City’s new signing Jack Butland starts. We reckon Asmir Begovic will eventually move on, and Butland will make the starting position his own, and will eventually compete with Joe Hart for the England no.1 spot. Southampton’s impressive left-back Luke Shaw is only 18-years-old, but is already the first-choice left-back at the Saints. He’s already earmarked as Ashley Cole’s long term replacement in the national team. Matija Nastasic is one of the best centre-halves in the league already, despite being only 20-years-old. He’s going to go on to become a genuine world-beater, and will start here alongside Cardiff’s new signing Steven Caulker. The giant centre-back will be crucial to the Welsh side’s chances of Premier League survival. Although Phil Jones will eventually start at centre-back for United, he’s more than capable of doing a job at fullback for any club in the league. Sir Alex Ferguson claimed that he could go on to become one of the club’s best ever players. 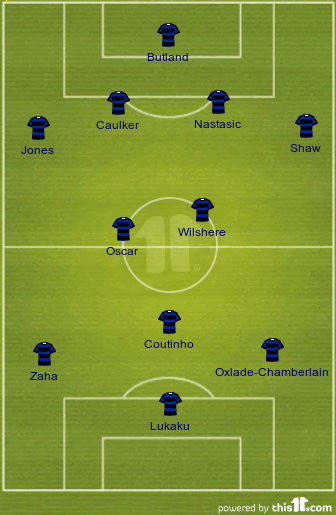 Jack Wilshere walks into the team in midfield, and will start alongside Chelsea’s £25m Brazilian Oscar. The technical ability and vision of these two can open any defence, and will help supply the wonderful attacking talent ahead of them. Coutinho plays in the no. 10 position. The Brazilian magician has quickly become one of Liverpool’s best players, and has been fantastic since his £8m move from Inter Milan in January, which has to be considered one of the bargains of last season. His Anfield partner Raheem Sterling is edged out of the wide spots by fellow English flyers Wilfried Zaha and Alex Oxlade-Chamberlain. The United and Arsenal man have pace and talent to burn, and will be integral to England’s hopes in the next decade. After his 17 league goals on loan at West Brom, the super-talented Romelu Lukaku starts in our central striker position. We hope Jose Mourinho gives him a chance at Chelsea to fulfil his talent and become one of the best strikers in Europe.